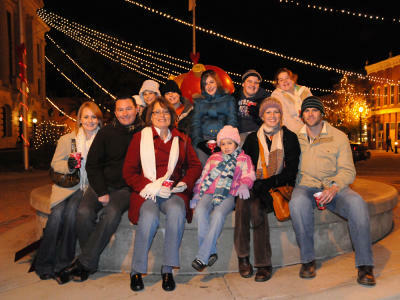 If your idea of a perfect holiday experience elicits visions of a Norman Rockwell painting or perhaps a scene from the classic movie, A Miracle on 34th Street, then Christmas on the Square may be the event to attend and Danville, Indiana, the place to visit this holiday season. Make this the year you start a new tradition by ushering in the season with Santa and Mrs. Claus, carolers, cocoa, the lighting of the square and a host of other activities that are sure to get you in the holiday spirit. This treasured event on the historic Hendricks County Courthouse Square serves up small town charm at its finest. Folks of every age delight each year the evening after Thanksgiving as the square transforms into a Christmas wonderland with family and friends gathered at every corner. Most refer to this day as Black Friday, but in Danville it becomes bright Friday, as they officially turn on the canopy of lights that stream down from every side of the square. But that isn&apos;t all. Our small businesses, organizations and churches go to great lengths to make this event a much-anticipated tradition. As you wander the square taking in all the colors and sights, the kiddos can take a ride on the trackless train, take a run down the Extreme Slide, decorate cookies and marvel at the giant snow globe. 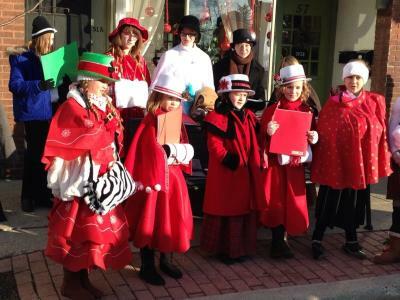 Don&apos;t be surprised if you see Christmas characters out-and-about (happy to pose for pictures), carolers from the Treblemakers and hot cocoa provided by Danville Kiwanis. You&apos;ll want to come hungry and make your way to the Danville Fire Department booth for some delicious chili. Our family always looks forward to the live nativity by the Danville United Methodist Church. So amazing. But, here&apos;s what I love most. Thanksgiving weekend is often busy with event after event. What you need to know is that this simple, yet profound offering is free and comes with no extra planning on your part. Just show up and enjoy. There are no tickets to purchase, and you can stay as long as you like. Make sure you do stay, of course, for the main event: the lighting of the Christmas tree and canopy over the square. It&apos;s magical. If you have family and friends in town for the holidays, bring them. They&apos;re sure to enjoy. This also provides an opportunity to soak up the surrounding businesses and eateries in Danville. You also can get the annual first glimpse of the Winterland drive-through light show in nearby Ellis Park. That attraction always kicks off just as Christmas on the Square is winding down and is just a short drive away.